Definition Length of the posterior fontanelle (Fig. 7.29). Landmarks The posterior fontanelle is a triangular structure. 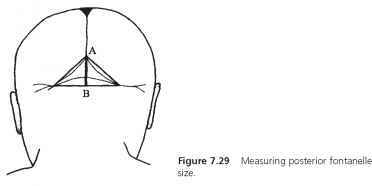 Measure from the anterior corner (A) to the midpoint (B) on a line connecting the two posterolateral margins created by the occipital bone (Fig. 7.29). Instruments Spreading calipers or a tape-measure can be used. Position The head should be held erect with the eyes facing forward. Alternative The neonate may lie prone. Remarks The posterior fontanelle is usually closed in neonates and only 3 percent of normal newborn infants have a posterior fontanelle that measures more than 2 cm. A third (or parietal) fontanelle may be found in about 5 percent of normal infants about 2 cm anterior to the posterior fontanelle. It occurs with greater frequency in Down syndrome and in congenital rubella syndrome. Fig. 7.30 shows normal values for posterior fontanelle size in African American and Caucasian American children at birth. Pitfalls If the sagittal suture is widely patent, the anterior border of the posterior fontanelle may be difficult to distinguish. 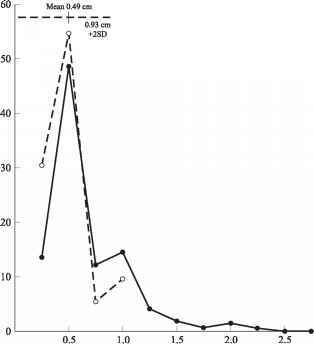 Figure 7.30 Comparison of posterior fontanelle size in African American and Caucasian American populations, both sexes, at birth. From Faix (1982), by permission. Is flat 1cm anterior fontanel normal? How to measure posterior fontanelle? What is the measurement of the posterior fontanelle? Which instruments are used in fontanelle circumference? Where to find posterior fontanelle? What is the measurements of the posterior fontanelle? How to find the posterior fontenelle on a newborn?